Hundreds of thousands of young Missourians are uninsured. Click the fact sheet below to see how the health coverage gap affects them, or download it here. Data derived from “Current Population Survey (CPS) Table Creator,” CPS Annual Social and Economic Supplements 2015, US Census Bureau, http://www.census.gov/cps/data/cpstablecreator.html. Data reflects health insurance coverage in 2014. See, e.g., Sara R. Collins et al., Young, Uninsured, and in Debt: Why Young Adults Lack Health Insurance and How the Affordable Care Act Is Helping (Washington, DC: The Commonwealth Fund, 2012), 2, accessed August 11, 2014, http://www.commonwealthfund.org/~/media/Files/Publications/%20Issue%20Brief/2012/Jun/1604_collins_young_uninsured_in_debt_v4.pdf. See, e.g., Karen Davis, “Exhibit 3: Uninsured Young Adults Most Likely to Have Cost-Related Access Problems and Medical Bill or Debt Problems in the Past Year,” in A New Era in American Health Care: Realizing the Potential of Reform (Washington, DC: The Commonwealth Fund, 2010), 9, accessed August 11, 2014, http://www.commonwealthfund.org/~/media/files/publications/fund-report/2010/jun/new-era/1419_davis_new_era_american_hlt_care.pdf. See, e.g., The Kaiser Commission on Medicaid and the Uninsured, “Key Facts about the Uninsured Population,” (Washington, DC: The Henry J. Kaiser Family Foundation, 2013), 1, accessed August 12, 2014, http://kaiserfamilyfoundation.files.wordpress.com/2013/09/8488-key-facts-about-the-uninsured-population.pdf; Collins et al., Young, Uninsured, and in Debt, 2. Estimated number of young Missourians who are uninsured, yet would not qualify for tax subsidies through the Marketplace because they fall below 100 percent of the Federal Poverty Level (FPL). Data derived from “CPS Table Creator,” CPS Annual Social and Economic Supplements 201, US Census Bureau, http://www.census.gov/cps/data/cpstablecreator.html. FPL = Federal Poverty Level. Income estimates based on “2015 Poverty Guidelines,” US Department of Health and Human Services (HHS), accessed December 15, 2015, https://aspe.hhs.gov/2015-poverty-guidelines. Certain individuals under 100 percent FPL, including parents of dependent children below 22 percent of FPL, pregnant women, and children may be eligible for coverage under Missouri’s current Medicaid and CHIP programs. “Medicaid Income Eligibility Limits for Adults as a Percent of the Federal Poverty Level,” The Henry J. Kaiser Family Foundation (KFF), accessed December 22, 2015,http://kff.org/health-reform/state-indicator/medicaid-income-eligibility-limits-for-adults-as-a-percent-of-the-federal-poverty-level/ . Data based on state-reported eligibility levels as of January 1, 2015. 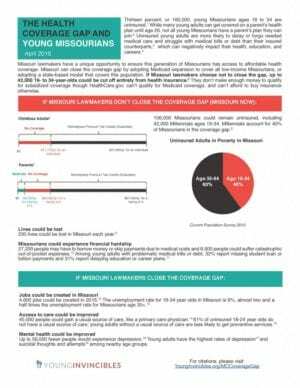 Estimated number of uninsured Missourians who fall in the Medicaid gap because they earn less than 100 percent of FPL. Ibid. CEA, Missed Opportunities 2015, 25. Catastrophic expenses are defined as out-of-pocket spending in excess of 30 percent of household income. CEA, Missed Opportunities 2015,28. Collins et al., Young, Uninsured, and in Debt, 2. CEA, Missed Opportunities: The Consequences of State Decisions Not to Expand Medicaid, June 2014 (Washington, DC: 2014), 31, accessed August 7, 2014, http://www.whitehouse.gov/sites/default/files/docs/missed_opportunities_medicaid.pdf. Data derived from “CPS Table Creator,” CPS Annual Social and Economic Supplements 2015, US Census Bureau, http://www.census.gov/cps/data/cpstablecreator.html. The Council of Economic Advisors (CEA), Missed Opportunities: The Consequences of State Decisions Not to Expand Medicaid, June 2015 update (Washington, DC: 2015), 19, accessed December 15, 2015, https://www.whitehouse.gov/sites/default/files/docs/medicaidmissedopportunities2015_final_v3.pdf. America’s Young Adults: Special Issue, 2014 (Washington, DC: The Federal Interagency Forum on Child and Family Statistics, 2014), 32, accessed February 1, 2016, http://www.childstats.gov/pdf/ac2014/YA_14.pdf. Sam Dickman et al., “Opting Out of Medicaid Expansion: The Health and Financial Impacts,” Health Affairs Blog, Exhibit 3, January 30, 2014, http://healthaffairs.org/blog/2014/01/30/opting-out-of-medicaid-expansion-the-health-and-financial-impacts/. Depression prevalence estimates for 18- to 25-year-olds exceed those for both 26- to 49-year-olds and people age 50 plus. “Major Depression Among Adults,” National Institute of Mental Health, accessed August 7, 2014, http://www.nimh.nih.gov/health/statistics/prevalence/major-depression-among-adults.shtml. See “Suicide Facts,” Suicide Awareness Voices of Education (SAVE), accessed February 1, 2016, http://www.save.org/index.cfm?fuseaction=home.viewPage&page_id=705D5DF4-055B-F1EC-3F66462866FCB4E6.